DevelopWise has won development approval for an unusual, curved apartment building in Wren Street, Mt Pleasant — the first eight-storey development in the City of Melville. 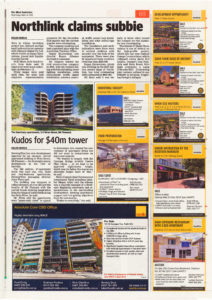 The $40 million, 47-apartment block will have one, two, three and four-bedroom apartments, DevelopWise managing director John Woon said. The building was designed to reflect elements of river life and the locality of Mt Pleasant with the curved facade drawing inspiration from the wings of native birds along the Swan River, he said. Mr Woon said the apartments were “generously sized” to appeal to downsizers who wanted the convenience of apartment living but did not want to compromise on space and amenity. 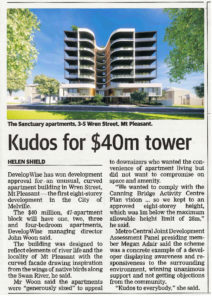 “We wanted to comply with the Canning Bridge Activity Centre Plan vision … so we kept to an approved eight-storey height, which was 1m below the maximum allowable height limit of 26m,” he said. Metro Central Joint Development Assessment Panel presiding member Megan Adair said the scheme was a concrete example of a developer displaying awareness and responsiveness to the surrounding environment, winning unanimous support and not getting objections from the community. “Kudos to everybody,” she said.